Posted on August 12, 2013 September 27, 2013 by Dayna Jacobs - "On Granny's Trail"
This is third in a series of posts about digitized records available on FamilySearch.org for the Western States. I previously introduced collections for Arizona and California and today would like to show you what is available for Colorado. Some collections are more plentiful than others, and as of today there are only 5 Colorado databases available. Two of them are valuable collections of marriage records, and the 1885 state census is also a good resource. 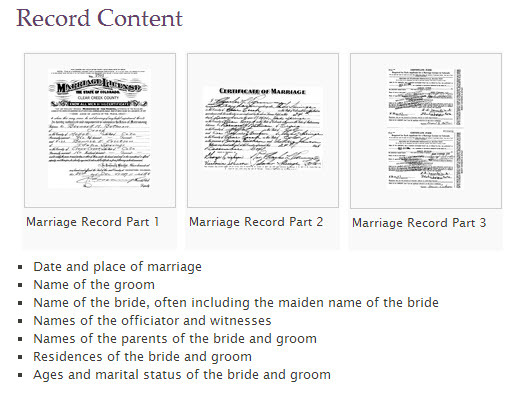 I love the “Colorado, County Marriages, 1864-1995” collection, because it includes an image of the marriage application, license, and certificate, and has all kinds of questions for the prospective bride and groom to answer regarding previous marriages, etc. 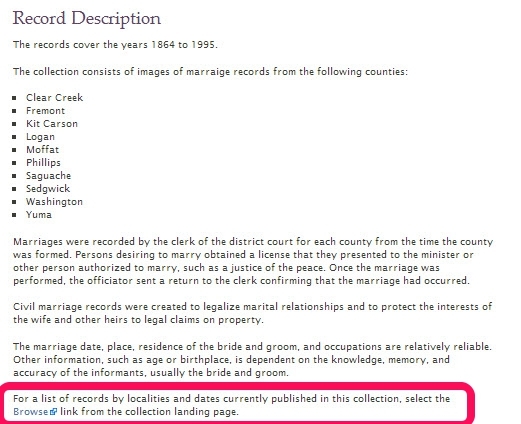 Remember, if you see the words “Browse images” instead of the number of records beside a collection title, this means the collection has not yet been indexed by the volunteers at FamilySearch. Do not despair! The collections are arranged in a way that you can drill down to the record you want without too much trouble, even if there is no index. Just put on your “I’m looking through a collection of microfilm” glasses to remember how you did it in the good old days (last year). Okay, now hit the trail! Previous Post What kind of pioneer are you? Next Post Happy Birthday Annie Marie Tanner Pomeroy!